Dollar Bay provides exceptional homes and enhanced public space on a constrained yet prominent site. 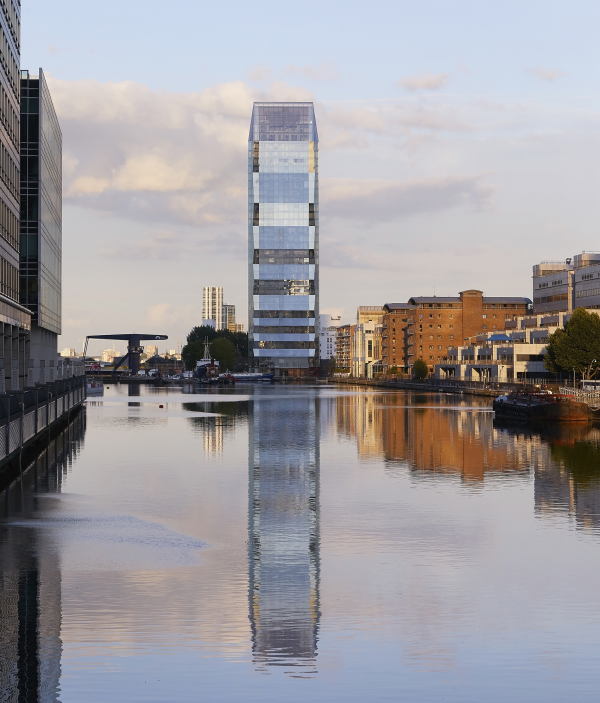 As a catalyst for high quality architecture in the area, it signals the re-development of the Isle of Dogs and provides 125 homes and a new public waterfront destination. 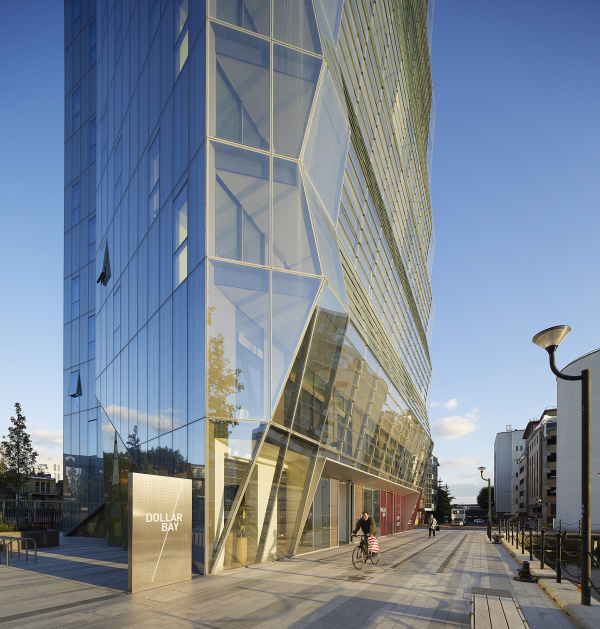 The building’s form is driven by the internal planning of light-filled, spacious and comfortable homes with spectacular views across London and Greenwich beyond. 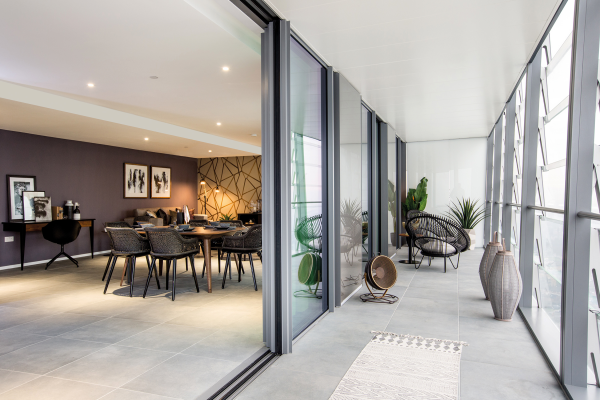 Each home benefits from a winter garden, an enclosed balcony offering residents the flexibility to extend their living area throughout the year. Generous communal facilities include resident’s lounge, dockside gym and private gardens. Rising as two crystal-like forms, fused together by a joint circulation core, Dollar Bay is designed to reflect the ripples from the water below and catch the changing light of the sun as it moves across the sky. 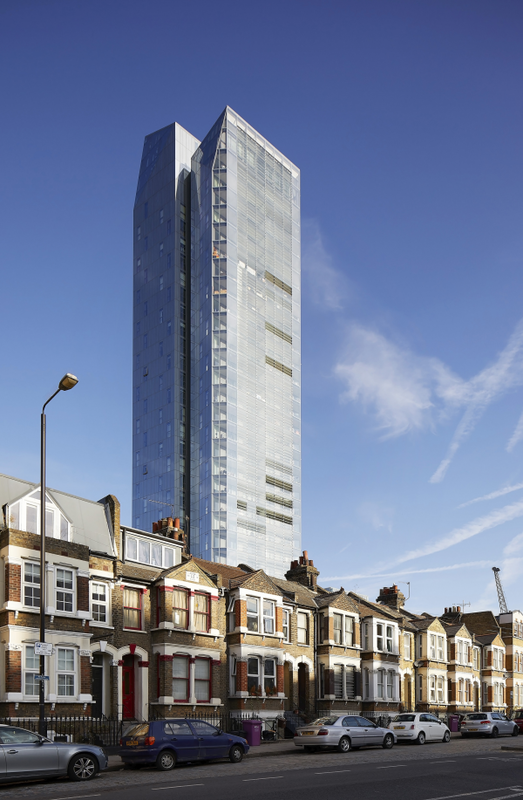 Its small footprint respects its low-rise neighbours, while standing at 31 storeys, it is modest compared to its towering Canary Wharf neighbours. At its base, a new public space encircles the building. Residents, locals and passers-by now enjoy fully accessible pathways to a rejuvenated waterfront area, landscaping, outdoor seating, public art and proposed café. Designing from the inside out, the floorplate was shaped and refined to maximise internal space and orientate homes to the east and west, allowing most homes to enjoy double or triple aspects. Generous winter gardens provide residents with a flexible amenity space they can use all year round. 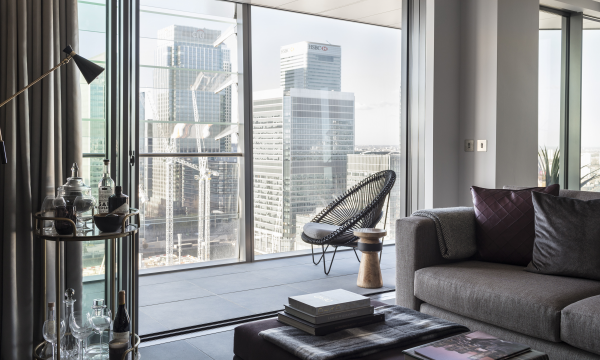 Floor-to-ceiling windows maximise views out and bring daylight in, creating a sense of openness and connection with the outside and allowing residents to enjoy vistas without walking purposefully to a window. Outside, a simple perfection infuses every line of Dollar Bay’s taught geometry. Driven by the internal planning, the building is split into two crystalline forms centred around circulation routes. The two forms are connected by a small joint that provides natural light and ventilation to the lift lobbies and corridors. The meticulously detailed façade gives Dollar Bay’s unique appearance. The west façade’s folds and creases evoke a cascading waterfall. 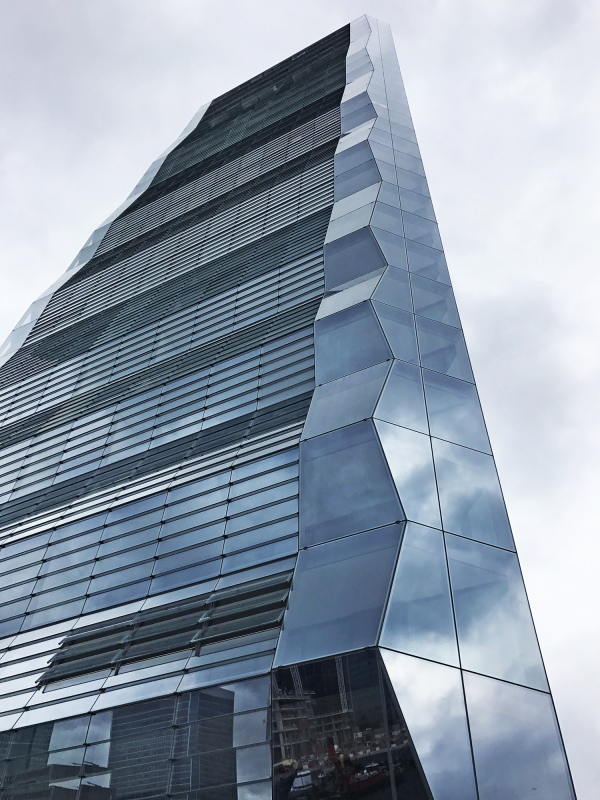 Reflecting water and sky, the clear and fritted glazed façades maximise views out, and adjustable louvres and openable windows enliven the façade, creating a constantly changing surface. The now fully-accessible waterfront promenade transforms the previously neglected quayside into a lively public space and provides safe passage to neighbouring areas. The building’s small footprint and location make way for this new public area around the free-standing tower’s base, which includes outdoor seating, lighting, landscaping and proposed café. A large private waterfront garden with integrated play area provides residents with a varied and secluded recreational space. 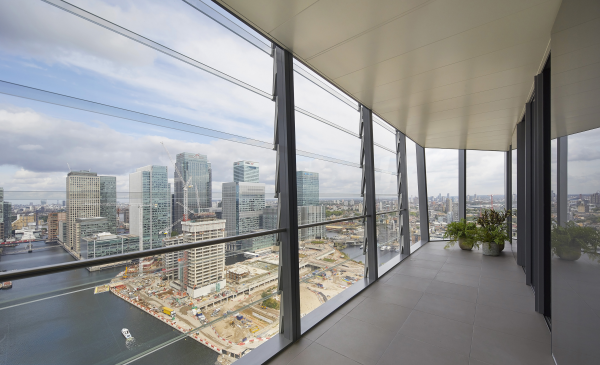 Well-considered layouts and incorporating winter gardens allow for additional space and unmatched views across London. Limiting five residences per floor and centrally positioning communal circulation results in one, two and three-bed homes exceeding Greater London Authority (GLA) requirements by 50%. 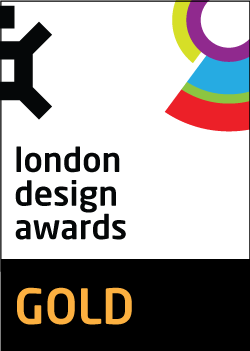 Winter gardens provide private amenity space that exceeds GLA’s requirements by 100%, and the local authority UDP housing policy HSG 15 requirements, while offering improved thermal performance. Extending across the east/west façades, they are naturally ventilated through a series of specially designed horizontal louvres that open outwards to almost 80 degrees. Overlapping glass panels held only by clips connected to aluminium arms at mullion positions ensure maximum transparency, allow for permanent trickle ventilation and keep homes water tight. 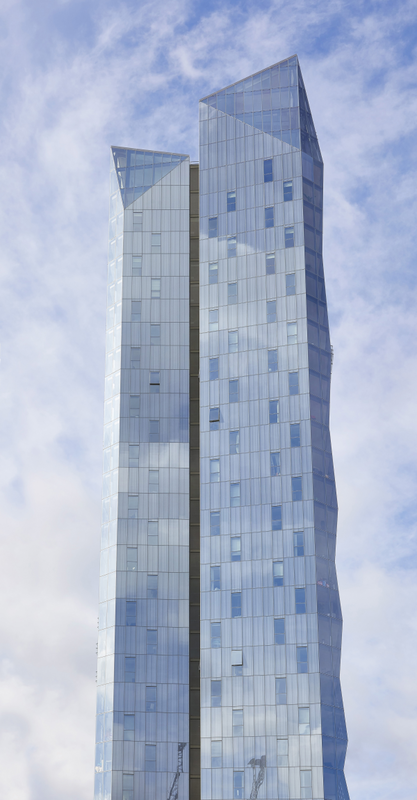 Splitting the building into two crystalline forms creates a tower with elegant proportions. This, coupled with meticulous façade detailing, achieves Dollar Bay’s unique appearance, maximises views out and achieves optimum thermal performance (more information about this in sustainability response). The west façade’s waterfall-like inward and outward inclines range from one to five floors high, generating horizontal facets which capture the light differently. All homes are fully adaptable for disabled use, Lifetime Homes compliant and achieve Level 4 for the Code for Sustainable Homes. Dollar Bay completed six months ahead of schedule and was awarded a Seal of Excellence by the National House Building Council (NHBC) showing commitment to the highest standards in housebuilding. Making the most of a constrained yet prominent site: With a relatively small footprint of 0.24 hectares on which to build and the site being closely bounded by low rise residential developments, the use of this small area was optimised to create a delicate tower that provides a transition from the scale of the immediate neighbouring context to the east, to the new larger scale of Wood Wharf to the north. Enhancing the pubic space on the previously unused waterfront promenade: Dollar Bay significantly contributes to local regeneration, supporting and enhancing the local community by providing a new waterfront destination for all to enjoy. The building touches the ground lightly to provide additional public realm space around the base of the building. Providing exceptional homes: A unique, comfortable and desirable living environment was developed for residents by providing spacious, light-filled homes with double or triple aspects and above standard amenity space in the form of winter gardens, allowing residents the flexibility to extend their living area. Dollar Bay is also an environmentally and financially sustainable building that does not compromise on design quality; it is meticulously detailed and uses the best materials. Incorporating the efficient use of resources, materials and energy from the outset makes Dollar Bay environmentally and financially viable. It was awarded the British Safety Council’s Globe of Honour for its sustainability credentials. The building’s footprint and façades are designed to make the building energy efficient: east-west façades are open while narrower, fritted and clear north-south façades maximise southern solar gain and limit north-facing homes. Efficiently located windows maximise daylight. 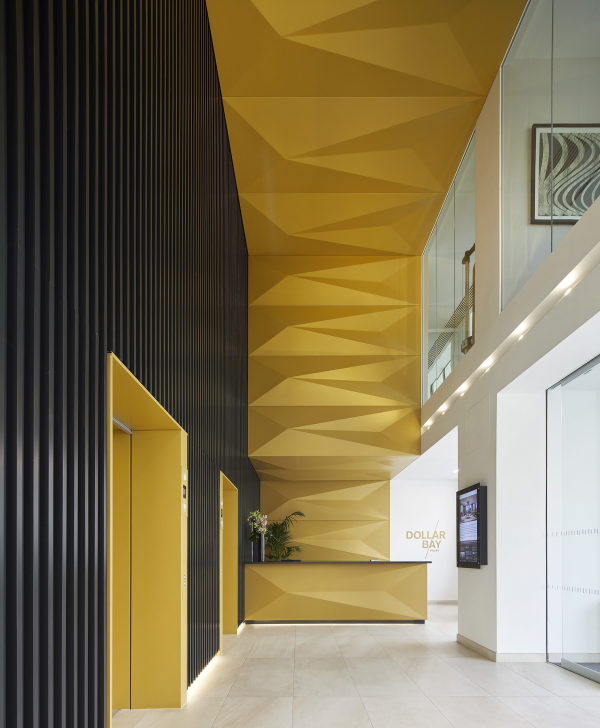 The gold mesh interlayer within the common areas’ double-glazed panels controls solar gain without obscuring views out. Winter gardens are a buffer zone to the open façades, catering for all weather conditions by creating their own microclimate. A unique dock water cooling solution - the first time London dock-water has been used to cool a residential building - is highly energy efficient, reduces carbon footprint, saves home owners money and ensures no unsightly plant equipment is externally visible. Rainwater harvesting is used for landscape irrigation, the ancillary building’s green roof provides biodiversity, and roof solar PV cells save energy. 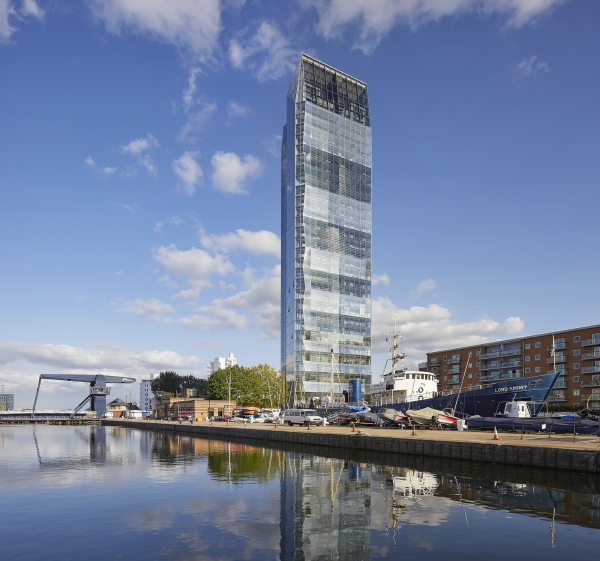 The scheme completed six months early through meticulous planning, innovative off-site production methods, BIM drawing coordination and prefabrication. The latter improved quality and a 44% reduction in on-site labour, reducing risk of accidents. Nearly 50% of homes were sold during launch and 87% in the first year.